The HiPP Diet Plan is based on the findings of nutritional science, paediatric medicine and our many years of experience. Which is why we recommend that you follow this plan when feeding our products. The information given in the diet plan is a guide. Fluctuations in your baby’s appetite are perfectly normal. Do not force your child to eat up an entire meal if they happen to show less appetite. To the diet plan for "From birth to the 4th month"
To the diet plan for "From 4th months to the 6th month"
To the diet plan for "From the 6th month"
To the diet plan for "From the 7th to the 9th month"
To the diet plan for "From the 10th to the 12th month"
Breastfeeding is the best for your baby. 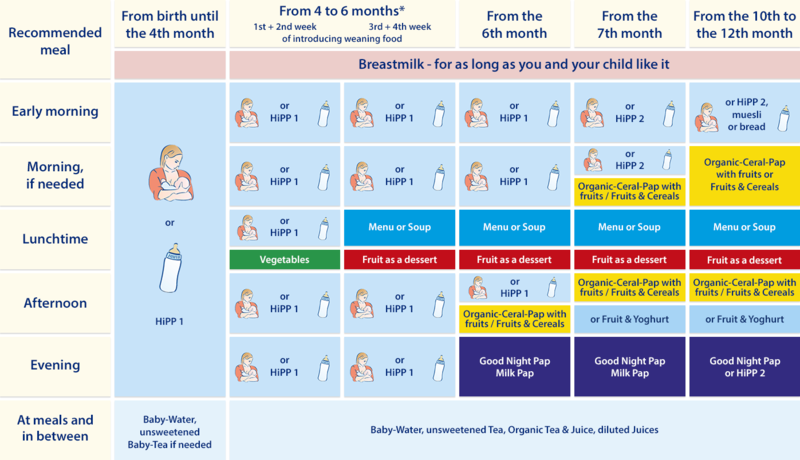 If you do not breastfeed, we recommend the HiPP Milk Formulae created for your child’s individual age group. *Start with weaning food according to your baby’s development and begin after the 4th month at the earliest and after the 6th month at the latest. Ensure a balanced variety by offering different kinds of pap. When starting on weaning food, according to scientific findings, the same recommendations apply as for children without a higher risk of developing allergies. Start according to your baby’s development and begin with weaning food after the 4th month at the earliest and after the 6th month at the latest – starting with weaning food later does not offer better protection against allergies. It is important to introduce weaning food step by step into your baby’s meal plan. This allows your baby time to get used to the new food and you will always be able to recognise which foodstuffs are well tolerated. Suitable products can be recognised by the symbol shown on the right.